Casey Key is an eight-mile-long barrier island joined to the mainland by two bridges. 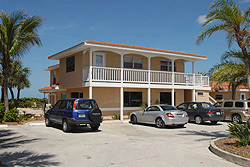 Casey Key is located between Siesta Key on the north to the island of Venice at the southern tip. There are two bridges providing access to Casey Key including an old "swing bridge" dating back to the 1920's. The majority of the island is less than 300 yards wide with the beaches along the Gulf of Mexico on the west and Blackburn Bay on the east. At the south end of the island is the Venice Inlet providing ready access to the Gulf of Mexico. Ground elevations on Casey Key are higher than most barrier islands which is highly beneficial to its property owners. There are less than 500 residences on Casey Key, and the owners are a combination of full-time, seasonal and vacationing families. Casey Key consists almost entirely of single-family homes and the sole commercialism consist of a few older beach motels that were grandfathered under prior zoning. There are no hi-rises or traffic jams. Visitors to Casey Key enjoy a quiet family island atmosphere, perfect for relaxing in the sun or enjoying leisure activities. Casey Key's white sand beaches are never crowded and supply exquisite souvenirs of shells and million year old fossilized sharks teeth. Casey Key's premier location is minutes from retail and outlet shopping, tennis, golf courses, fishing, boating, theaters and play houses, museums, incredible restaurants, headline entertainment, day cruises offering sightseeing or fishing, and many other attractions. For more information contact the Venice Area Chamber of Commerce.